London's Claridge's has announces that the iconic hotel's Christmas tree for 2018, named "Tree of Love," will be designed by legendary fashion designer Diane von Furstenberg. Diane, an old friend of Claridge's, is going to unveil the "Tree of Love" to the public in the hall of the hotel on November 27, 2018. Diane von Furstenberg is a fashion designer and philanthropist, the pioneer and president of the fashion brand Diane von Furstenberg. In 1974, she designed the symbolic wrap dress which became the symbol of independence and strength for women around the world. Diane von Furstenberg said: "Claridge's is my favorite hotel and my warm home in London. I feel lucky to be invited to design the Christmas Tree. I feel so honored and excited. The 'Tree of Love' must be the carnival celebration of love and life." 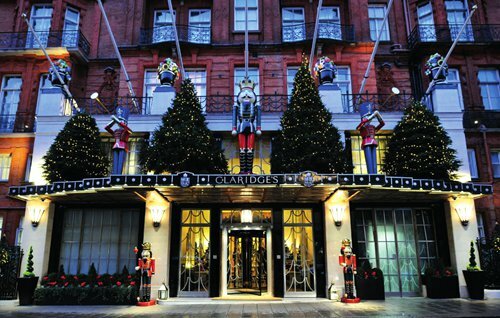 Paul Jackson, general manager of Claridge's, said, "For Claridge's, Christmas is the most special day of the year. This year, we welcome Diane to display her creative magic with great expectations. Diane designed a series of rooms and suites with her personal style in 2010 and since then, we have been looking forward to cooperating with her." The year of 2018 is the ninth year for Claridge's to invite excellent designers to collaborate during the Christmas celebration. Claridge's Christmas tree in 2018 will be the brightest tree in London during the holidays and it's a main attraction for tourists and locals in London to appreciate the unique innovative design. Claridge's is located in the central area of Mayfair district, London. As one of the affiliated hotels of Maybourne Hotel Group, it boasts England's grand architectural style and shows everlasting charm. Its privately customized services are faultless. Meanwhile, it is also the provider of the most luxurious rooms and suites and it's an artistic treasure of London.